Providing users with an object’s history of actions is often required for business purposes. The history may include different actions with the object and/or with related objects. You need to decide what information you want to show in the history before implementing it because it will be rather difficult to make any changes later on. Also, you must understand that the history is stored in the database. Thus, avoid recording such frequent operations as object views (for that, for example, you can add a separate entity/register and show this information in a report). When you add a new action, you can also attach an icon – it will be used for displaying the action history in the web application. Once the object is configured, you need to process and save history events to the database. You can do that using the EleWise.ELMA.Events.Audit.IEntityActionEventAggregator extension point. 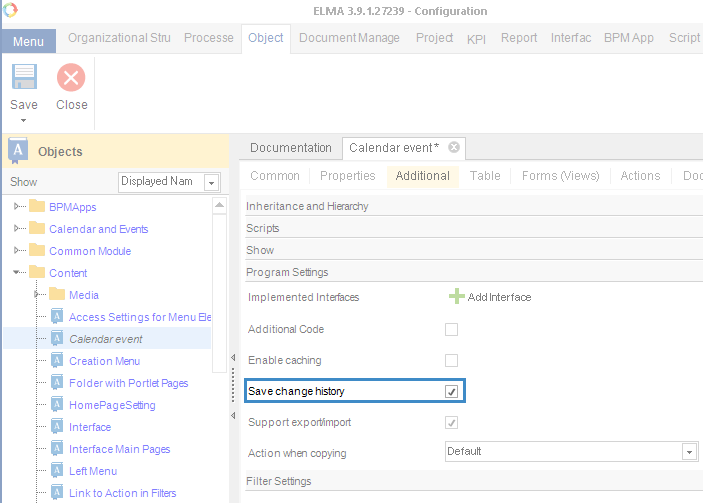 Data processing means preparing events (history items) of the EleWise.ELMA.Model.Events.EntityActionEventArgs type for saving (aggregation, conversion, and deletion of excessive events). You must remember that the three base events Create, Update and Delete are always saved to the database. This code checks if the event type identifier = identifier of Add comment event (we added this action in Designer earlier). Most events change the object model. For example, the task status changes when you complete the In Work action. To process such events, use the EleWise.ELMA.Events.Audit.Impl.BaseEntityUpdateEventAggregator base class-implementation of the IEntityActionEventAggregator extension point. It also finds the information about the entity’s old state (before action happened) and adds it to the event. Thus, the base class finds the appropriate EleWise.ELMA.Model.Actions.DefaultEntityActions.Update base event in the list of transaction’s events gets the old entity’s data and adds it to the Old property of the EntityActionEventArgs class. If necessary, you can also override any of the base class methods. As mentioned above, events in ELMA are based on the EleWise.ELMA.Model.Events.EntityActionEventArgs class and its heirs. One of the heirs is the class that implements the Update entity event (EleWise.ELMA.Model.Events.EditEntityActionEventArgs). According to these classes, ELMA generates entities of EleWise.ELMA.Common.ModelsIEntityActionHistory type when events are saved to the database. Data returned by the GetAdditionalData method will be saved to database and then when a user requests the object history, this data will be passed to the SetAdditionalData method. Thus, if you override these methods, you must ensure Backwards Compatibility. How to display history in the web application? To display object history in the web application, you can use the EleWise.ELMA.Web.Mvc.Models.History.BaseAuditEventRender base class-implementation of the EleWise.ELMA.Web.Mvc.ExtensionPoints.IAuditEventRender extension point. Look at the interfaces that this class inherits. There is ICalendarEventHistoryModel – an empty interface from Calendar module, we will use it later to define the model class. 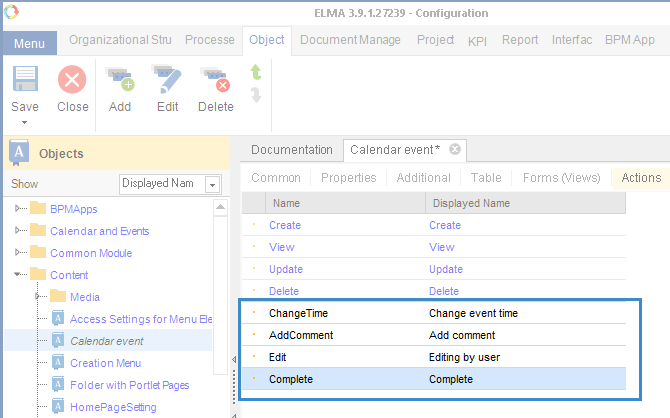 Other interfaces inherit the EleWise.ELMA.Events.Audit.IHistoryBaseModel base interface for displaying history. Later on, we will show you how to create your own history items. How to collect additional data for displaying in history? Later on, these events are processed and history items are generated according to them. 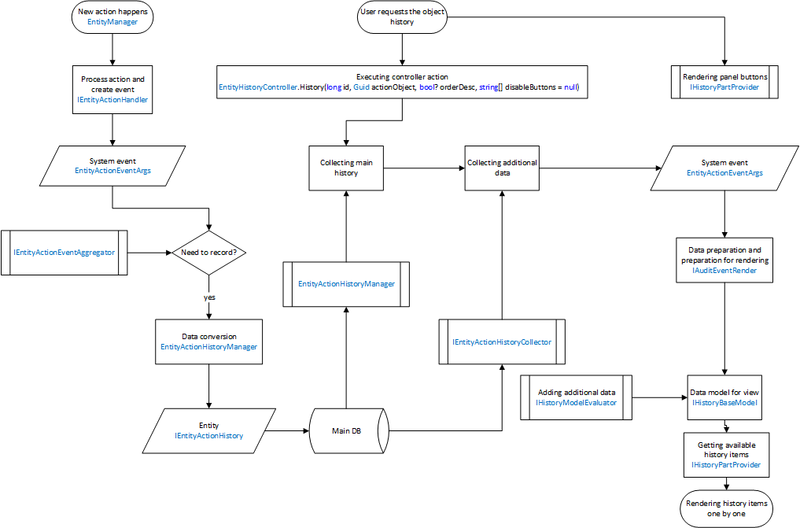 Here you can see how we use the empty interface ICalendarEventHistoryModel mentioned above. In the same way we implement the heir of the attachment’s provider base class AttachmentHistoryPartProviderBase. Note that this provider is an extension point and its implementations are called every time ELMA renders the history panels for all data models. Thus, you must clearly define the data you want to display for your objects. Otherwise, they will appear in the history panels of other objects. Next, we need to prepare data for display in history. To do that, you need to create a new class and inherit it from the EleWise.ELMA.Web.Mvc.Models.History.BaseAuditEventRender base class (it is the front end component). The main purpose of this class is to create correct data for displaying a history item according to the event data (EntityActionEventArgs) from the database. You can also create a class and inherit it right from the EleWise.ELMA.Web.Mvc.ExtensionPoints.IAuditEventRender to implement completely custom logic for displaying history items, but we do not recommend doing that. In some cases, you might want to add custom history items or custom buttons to the history panel. To do that, you can implement the EleWise.ELMA.Web.Mvc.ExtensionPoints.IHistoryPartProvider extension point and create your own base class to add history items and/or buttons.